This is a very clean 1952 35mm. OMEGA SEAMASTER in steel with the correct OMEGA winding crown, perfectly restored black dial, original Dauphine hands, (just cleaned) caliber 354 bumper automatic movement; all displaying very good overall condition. I like the steel (original) arrow raised markers against the black dial. 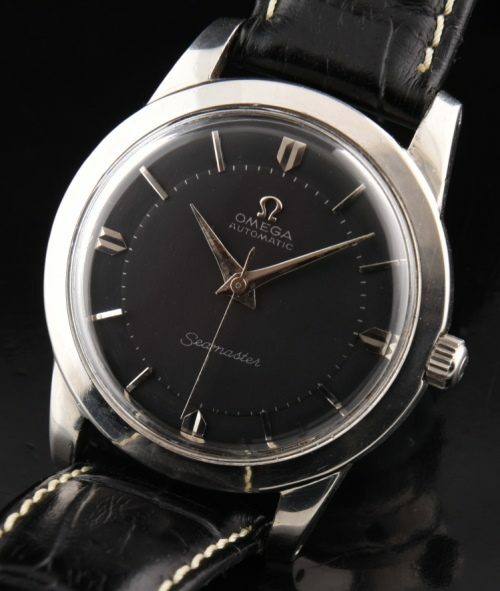 This is a reliable vintage OMEGA watch you can wear for years to come.